Are My Vehicle's Hoses Leaking? Your car is naturally going to leak a few drops of fluid every once in a while, but you should be wary of ongoing leaks. When a leak isn’t addressed immediately, it could result in major damage to your engine. Luckily, most drivers can quickly check for hose leaks within nothing more than a few rags. The easiest way to find a leak is to wipe down the area below your vehicle’s engine just before you go to bed. When you wake up, there should be no more than a drop or two under the vehicle. While your engine is cold, you can also wipe down the hoses with clean rags to see if any residue comes off. If a leak seems to be excessive, then you should stop by Parks Fiat of Wesley Chapel for a diagnostic test. Our service department in Wesley Chapel is ready to help you with all of your maintenance needs. 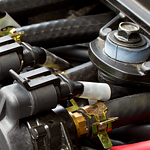 Call us today to speak with one of our friendly and experienced mechanics.